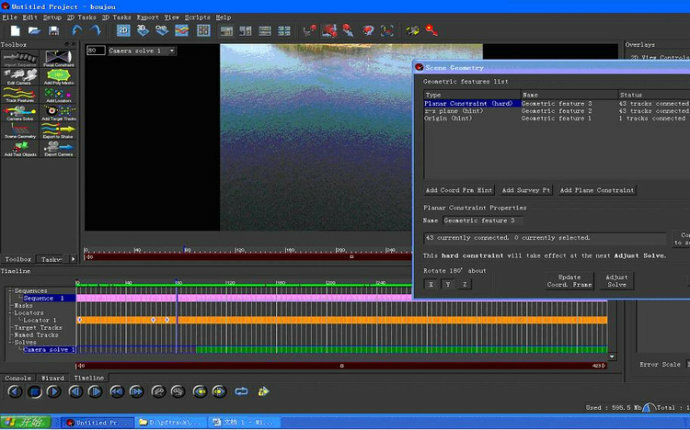 In recent years, have been in contact several tracking software, it can accurately called reverse camera software, and we track them in the synthesis software, such as AE, DF, CB, and so can not be compared, compositing software tracking 2D tracking is to obtain a tracking data so as to be replaced at the screen, the scene repair work, which is several software but through 2D tracking is obtained camera information, such as location, direction of movement, so that the output 3D software to add three-dimensional element, of course, since the software is 2D tracking, of course, also possible to output the data to the synthesis software for use. For more reasonable comparison, the same material I used to be. Creative aerial.mov. I do not know this creative upload where appropriate, temporarily placed podcast, you can see the actual picture. 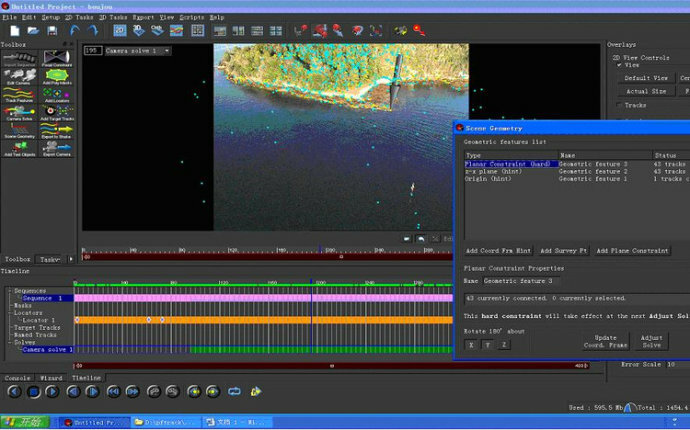 Before tracking, tracking we should head to have a comprehensive understanding of the material must first be analyzed, the camera is fixed on a tripod, or the movement, its Focal length has not changed, how its quality, there is no distortion or need to stabilize these you should be aware of. Second, you want to add in what creative elements, is for the day, for the building to change plus snowing fire explosion effects and so on, what position should the hearts of not a few. Such tracking during the time, those places is the focus, where you need to add those points you can manually track a pretty good idea. If you are at the scene, shooting parameters and understand the path of movement of the camera, so tracking them you will do better, so if you have the opportunity to go to the site. Oh, a little Roseau, I hope everyone’s appetite did not fall below enter a formal tracked. For a more fair, here Before automatic tracking use the default settings. 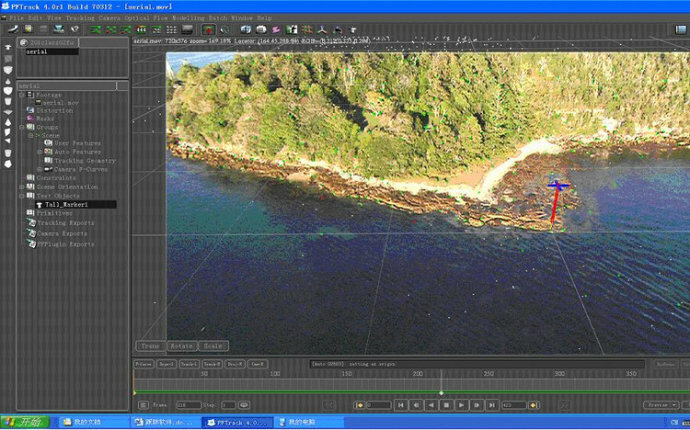 First, by the following BOUJOU, this software is called the world’s first commercial commercial automatic camera tracking system to track high precision, simple operation known. In the first row as it should. Step 1, transferred material aerial.mov. Pictures, can be seen in the frame 0-100, and not the path of the camera. Generally speaking, it can be counted as successful, but in fact, at 0-100-frame, the video is a sea, it is really not the point, but the island is the key, look at the situation around the island, quite the reverse tracking it is good. Generally speaking, BOUJOU track, I think it is the highest level of a fully automated, the drawback is difficult to handle manually adjusted items too, encounter complex scenes. About another software Match mover, with its friends may be less, and it’s relatively easy to get started operation, the installation took several creative and tutorials are also included, and I think this is very good, we do not all over the world to find a tutorial and creative. 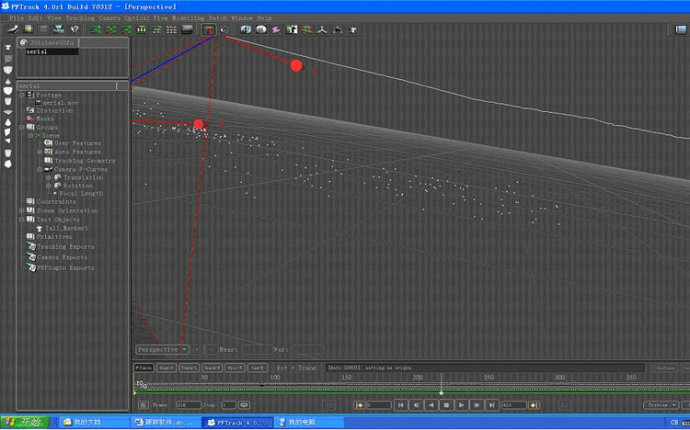 Follow the manual to do next, I feel very good, especially in terms of motion capture, it can be said that a major feature of it, I heard now integrated in MAYA inside, interested friends can try. Secondly, how to look PFTrack effect. I was under the foreign network disk a new version 5.0, through practical application, in the tracking accuracy of less than 4,0 as the accurate, but also there are some BUG, ​​do not know why. So here are still using a version of 4,0. Have the opportunity to again look for the reasons. If you open the pixels farm official website (www.thepixelfarm.co.uk) look, at home we read ahead (we lead), others follow. Pixel farm can be seen in their company’s software PFTrack still very confident, also shows PFT in this field must have its unique. 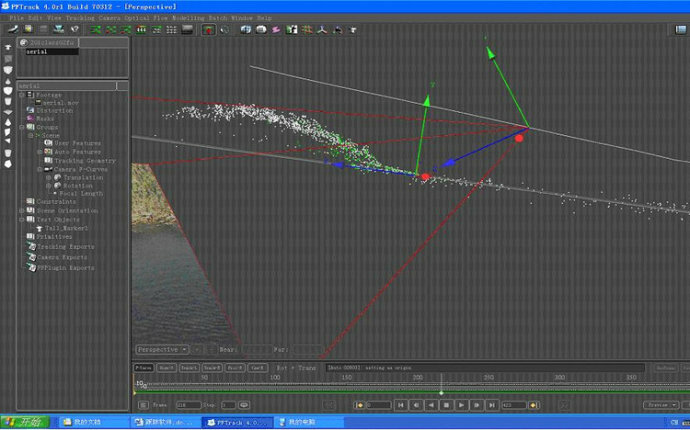 In terms of training institutions, FXPHD and CMIVFX have been out of this software tutorial, the other did not care, I was through their tutorials to learn this software, material is a material we used FXPHD second lesson. Step2, click Auto track fully automatic tracking. Oh, the time off really Mana, ah, ah. The results finally came out, it appears that the retirement of the computer, have to live a little dawdle. 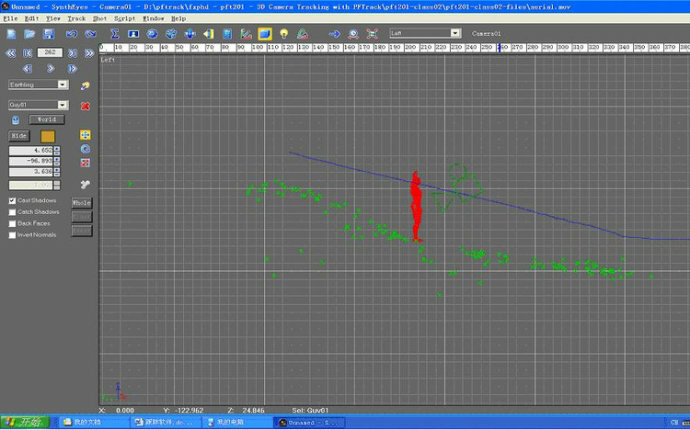 Fortunately, the results did not disappoint, and even the beginning of the frame 0-100 solver also out, although the curve is not so smooth, in general also had to go, just in view of smooth curves look normal. From the interface can be seen, PFTrack complex than BOUJOU more, manually adjusted items is also a lot of accuracy can reverse adjusting them in many ways. Oh, the only difference between the speed of the points. Finally, we look Syntheyes it, you can say it can be a software reverse a rising star, so he came in last appearance, I use the 2008 version. Among other things, look at the process. STEP2, the overall summary panel panel, click inside the AUTO button directly tracking and solving. Oh, saving enough of it. What a rising star, the speed did not say, my computer seems not ready to throw throw, to work under the SYN or the case, the results of it, also said in the past, although undulatingcurve a little obvious, but a little adjustment on it, I am here only to all the tracking pointsmoothed a bit. Here are the results after adjustment. 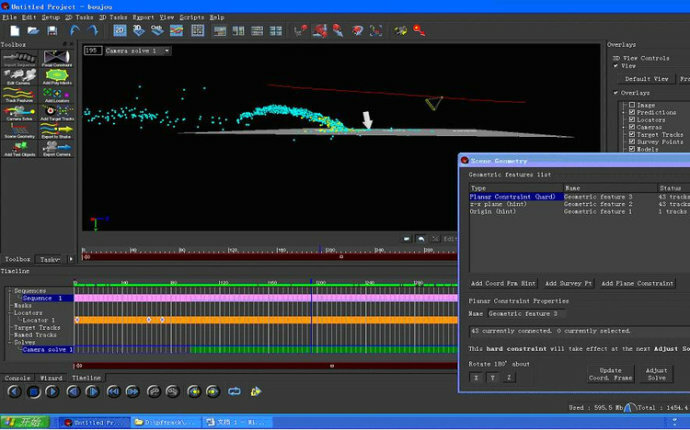 Here are just these three software has a rough comparison, default conditions, PFT solvermost accurate but also the slowest, SYN faster and better, while BOUJOU also said in thepast. As for how you look, but also hope to speak out and share.